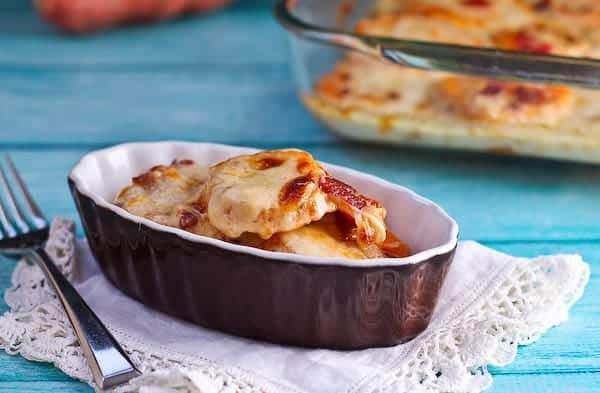 These scalloped sweet potatoes will be an unforgettable side dish on your Thanksgiving table — full of rich gruyere cheese and flavorful bacon, they are sure to be a hit! Well, now that Halloween is over, get ready for all things Thanksgiving!! Stuffing, turrrrkey, cranberries, and of course sweet potatoes! You all know the classic Thanksgiving sweet potato casserole topped with marshmallows? This is nothing like that. Not that I have anything against that iconic dish — I actually have a interesting take on it coming up later this week. These scalloped sweet potatoes are sort of sweet potato casserole’s sophisticated older sister. They are rich and decadent. They have a ton of great flavor thanks to bacon (obviously) and shredded gruyere cheese. I also took it one step further and roasted the potatoes with a little maple syrup to increase the flavor. You could also boil them if you wanted to….but why? 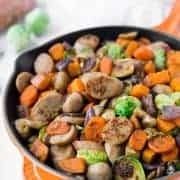 I’m clearly biased towards roasted vegetables since I loooooove them, but roasting the sweet potatoes is really a great addition to this recipe. And it’s a pretty simple step to do while you’re preparing the sauce, shredding the cheese, cooking the bacon, etc. I used a shallot in these sweet potatoes, partly because Ben doesn’t like a really strong onion flavor, but mostly because I didn’t have any onions. What kind of food blogger runs out of onions? The kind of food blogger with two toddlers, that’s what kind. My point is, shallots were awesome, but onions would be great too. I’d use about a half of a small yellow onion — a 1/4 cup to a 1/2 cup would be perfect. Preheat oven to 425 degrees Fahrenheit. Toss sliced sweet potatoes with oil and maple syrup and arrange in a single layer on a baking sheet. Sprinkle with salt and pepper. Roast for 20 minutes or until browned on the bottom and tender. Remove and set aside to cool. Meanwhile, fry bacon in a large skillet over medium-high heat until crisp. 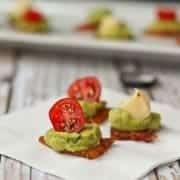 Set aside on a paper towel-lined plate. Reduce heat to medium, add chopped shallot to bacon drippings and cook until tender. 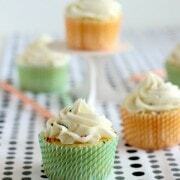 Whisk in flour over low heat and cook to a paste. Add milk and cream slowly while whisking and cook until mixture thickens slightly. Remove from heat and stir in all but 1/2 cup of the Gruyere cheese. 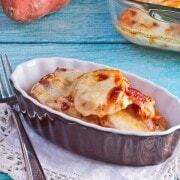 Arrange half of the sweet potatoes in the bottom of an greased or sprayed 11×7 inch baking dish. Pour on half of the milk and cheese mixture. Sprinkle on half of the bacon. Arrange remaining potatoes, pour the rest of the milk mixture over the top, and sprinkle with remaining bacon. Sprinkle remaining cheese on top. Bake for 20 minutes or until potatoes are tender. Brown cheese for 1-2 minutes under the broiler if desired. Verdict: These were amazing! Loved that you only needed to eat a little bit to really enjoy them. Husband’s take: Heard no complaints from him! Changes I would make: None are necessary, but if you wanted to bulk this up a little to serve more, you could easily add in another sweet potato. There is plenty of sauce and cheese to go around. Still looking for some new sweet potato ideas for this Thanksgiving? Try Twice Baked Sweet Potatoes, Maple Mustard Roasted Sweet Potatoes with Shallots, Boston Market Copycat Sweet Potato Casserole from The Slow Roasted Italian, Baked Sweet Potatoes with Feta, Olives and Sundried Tomatoes from Gourmande in the Kitchen, or Bourbon Mashed Sweet Potatoes from Simply Recipes. sweet potatoes > all other potatoes. this sounds sooooo delish! I wasn’t going to make a thanksgiving dinner this year, I was thinking of going totally non-traditional, since itll just be the four of us, but this one single dish is trying really hard to change my mind. LOVE. i always have sweet potatoes w/ brown sugar for thanksgiving…may need to change it up this year. this looks seriously yum! I loveee that you took a traditional potato dish and swapped the white potatoes out for sweet potatoes. This sounds SO delicious! 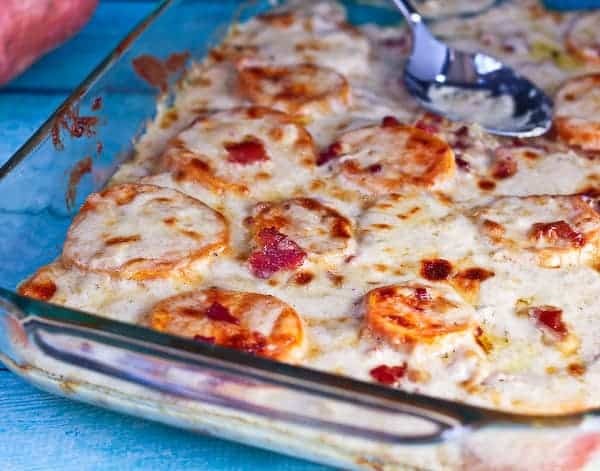 Scalloped potatoes are my favorite! These look so cheesy and delicious! Sharing! I love the sound of this Rachel! I will eat sweet potato almost any way but throw in that great combo of gruyere and bacon and I’m totally sold. Ok this was not the best recipe to read after a workout. I WANT TO EAT THE WHOLE PAN!!! Yum!! This looks heavenly. That is all. Yeaaas this sounds awesome. Maybe I’ll just eat this instead of all the other Thanksgiving dishes? Mmmmm I think its an excellent plan! Oh forget the marshmallows! I never cared for my sweet potato casserole with them….plus the gruyere is amazing! I make something real similar. But I am loving your scalloped version! Move aside marshmallows, because there is a new goodness in town and it’s name is Gruyere and bacon! 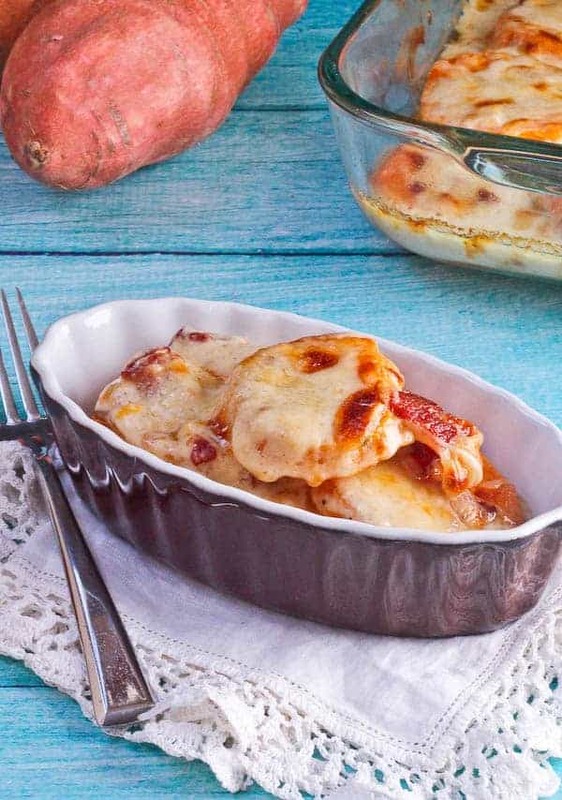 I love scalloped potatoes, but I have never tried then with sweet potatoes. And then you add Gruyere and bacon and I died. Pinned!